The D-Guard Bowie is a legendary battle weapon, part sword-part knife. The powerfully balanced design makes it a favorite tool for many tasks, but was kept ready for battle at all times. 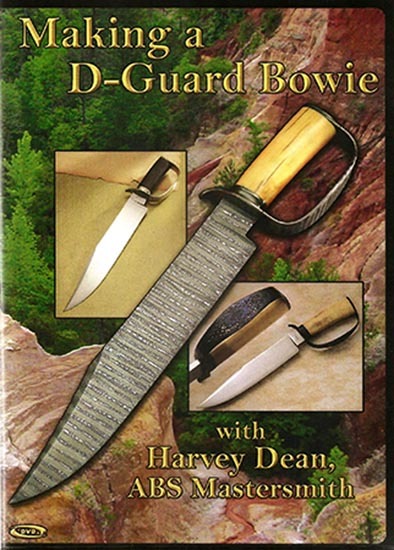 Harvey Dean has revealed his secrets and improvements for making a more secure and artful D-Guard Bowie in this 2 disc video, including an interview with the Mastersmith himself. Harvey Dean, an ABS Mastersmith since 1992, is an award winning knifemaker who teaches all over the country and specializes in Civil War era knife designs including his famous D-Guards. Watch this video over and over to improve your skills. This video is a must-have for knifemakers, collectors, or enthusiasts in edged art and history. Color, 3 hrs., 13 min. total time, full screen format, 2 discs, English, no subtitles.